Were you aware that your choice of handbag says a whole lot about you? Who would have thought that a decision that we usually make without a second thought can have such an impact on the image we project about ourselves to others. We are how we dress though, and the handbag is one of the most important statements about our outfit, because it reveals how we conduct our lives. ASDA Direct Sell XBox One for £3429! We have been keenly following the news about the release of the Xbox One and PS4, and getting more and more excited as their release becomes imminent – just in time for Christmas. 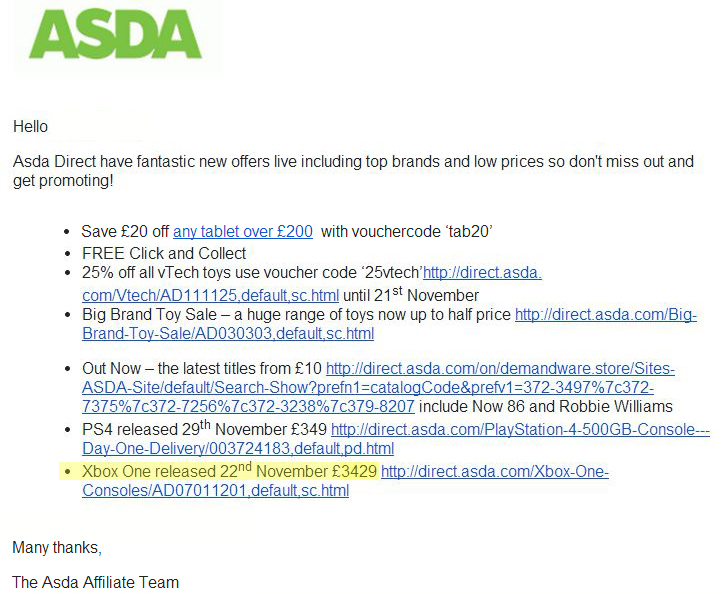 Imagine our horror when we received an email detailing ASDA Direct’s latest offers and discovered that they intended to launch the XBox One at a price £3429. We have been saving up for our console in the past few months, but this price put it firmly out of our reach. Whether you are planning a big Christmas party and want to cater to your guests’ individual preferences, or you are wondering what you are like around Christmas, here is a bit of information on what your sign says about some typical holiday activities. Let me start by saying a huge thank you to everyone who entered our Stoptober competition during October 2013. We had a great response to it, so hopefully there are plenty of you out there that are well on the way to stopping smoking for good.